Set sail through all 8 of Liverpool's docks right up to Liverpool Marina. Enjoy a three course meal whilst taking in the stunning scenery. Step on board the custom-built, 50 capacity Floating Grace. Our evening dinner cruises provide a special and atmospheric dining experience, perfect for a relaxed evening with friends and family or a romantic meal with a significant other. Board the boat at the Albert Dock and enjoy a welcome glass of bubbly as the boat sets off. 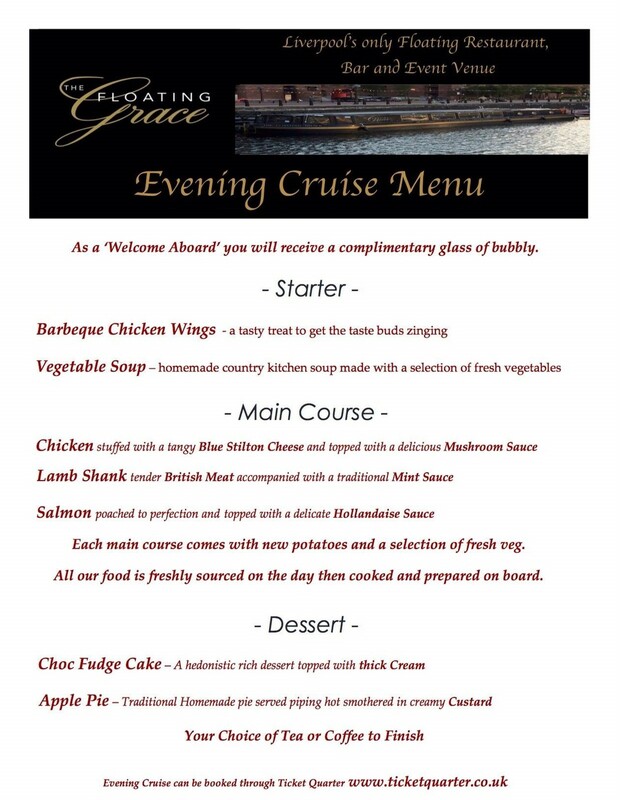 Our staff will then serve your three course meal as you peacefully cruise through Liverpool’s historic docks. Please provide us with advanced notice if any member of your party have allergies or special dietary requirements. 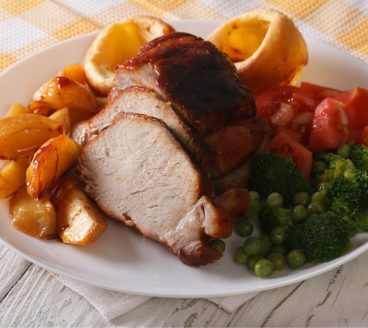 For a different take on the classic Sunday lunch experience step aboard The Floating Grace for a relaxing cruise. Our talented chefs prepare a tasty three-course set lunch, with children’s menus available, so there really is something for everyone. Board the boat at the Albert Dock and enjoy a relaxing cruise down Liverpool’s historic docks as our staff serve your meal. 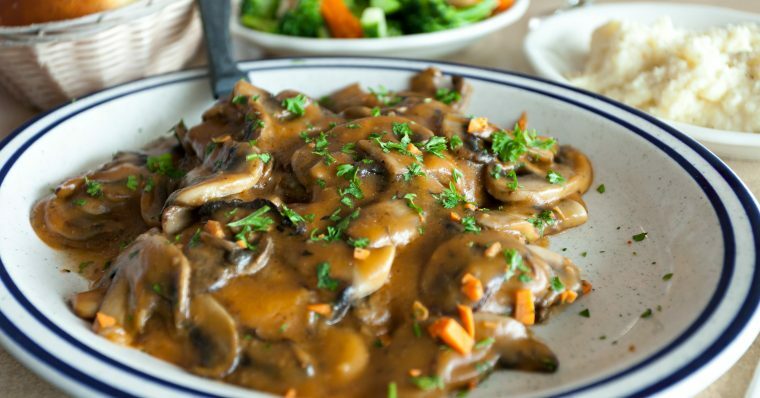 Best enjoyed with friends and family. Introducing our new Afternoon Tea cruise, a special trip to be shared with friends and family! 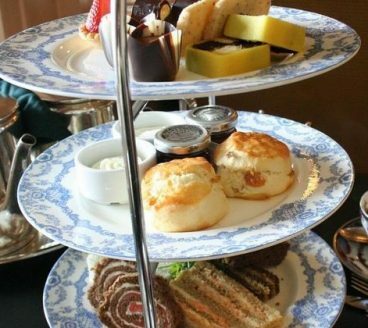 Enjoy the splendour of Liverpool’s docks with a relaxing cruise and tasty Afternoon Tea for a truly unique experience. Enjoy a mid afternoon 1 hour historical guided cruise on board Floating Grace whilst enjoying tea, cakes and sandwiches. Boarding begins at 2pm, as we set sail at 2:30pm. 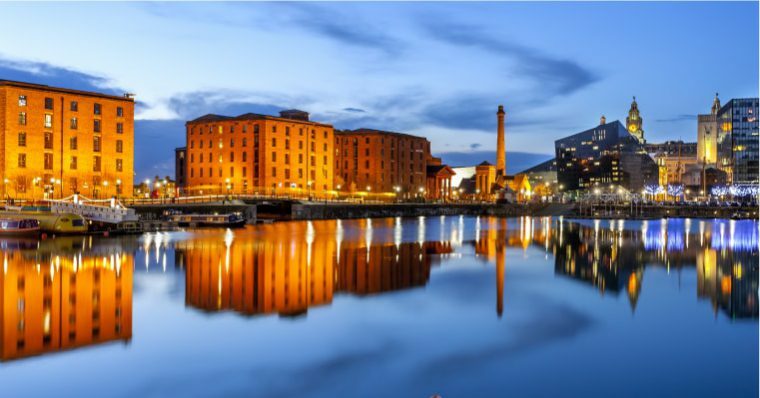 Opened in 1846, the Albert Dock and surrounding area has played a key part in Liverpool’s maritime history. The stunning architecture is a must see and, on one of our cruises, you get to view the waterfront from a new and unique perspective. 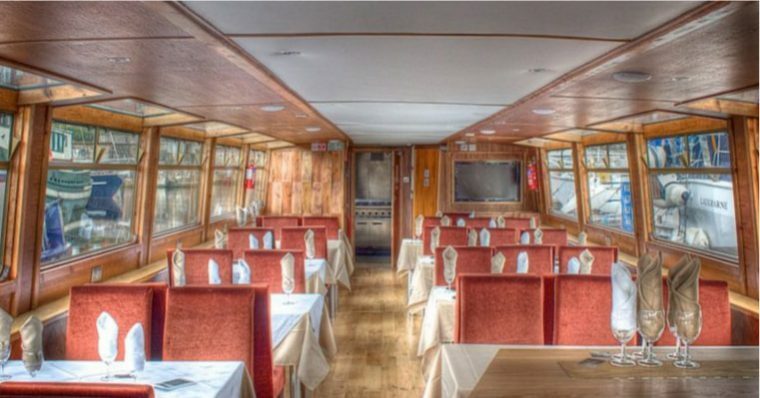 If you are looking to host a memorable private or business event The Floating Grace is a fantastic option. With audio & visual facilities, full-service catering and an on-board bar you have everything you need for an unforgettable time. Our stunning set menu caters to all tastes and preferences. Step on board and enjoy a glass of bubbly on arrival. 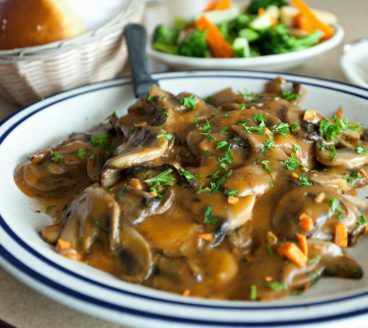 Our talented staff will then serve your chosen starter, main course and desert. Enjoy your food, drink and tranquility of the cruise.